Masseria di 3 BR casa con giardino e terrazza sul tetto! Io sono un americano che si innamorò di San Miguel, così ho costruito una seconda casa qui. Il mio tre camere da letto, due e un mezzo bagno di casa offre tutto il fascino di architettura coloniale! L'architettura include Saltillo pavimenti, travi in ​​legno e boveda soffitti, finestre in pietra ovali, camini in pietra nel soggiorno e camera da letto matrimoniale, piastrelle dipinte a mano in cucina e bagni, balconi fuori tutte le camere da letto, e un cortile alberato con una fontana cantera. Io fornivo personalmente e decorato la casa con arte popolare e ceramica raccolti negli ultimi 30 anni. La casa offre anche tutte le comodità di una nuova casa, tra cui l'acqua purificata, un angolo bar nel soggiorno, cucina moderna con fornello a gas e lavastoviglie sei bruciatori con la griglia, i fan del telecomando nelle camere da letto, citofono, TV satellitare, Wi- Fi, Internet ad alta velocità, telefono, caminetti a gas e un parcheggio privato fuori strada. La terrazza sul tetto offre una vista incredibile sulla città e la zona circostante, in più è un luogo ideale per godere di tramonti tequila e notti stellate. La casa è estremamente confortevole ed è un luogo ideale per rilassarsi e sentirsi a casa. Bambini piccoli e gli animali non sono ammessi. Vietato fumare. La casa è situata in una zona sicura e tranquilla a pochi passi dal centro della città. Il famoso Instituto Allende è a pochi isolati di distanza, dove sono offerti corsi in lingua, la scrittura e le arti. Un grande supermercato, Mega, è solo una breve passeggiata o un viaggio in taxi dalla casa. Una delle migliori caratteristiche di casa mia è che è molto conveniente in modo che tutti possano godere di SMA tanto quanto me. San Miguel è elencato come uno dei dieci migliori destinazioni di vacanza in tutto il mondo per gli ultimi tre anni, in base al Conde Nast Magazine. Questa città cosmopolita ha ristoranti di prima classe che offrono salmone affumicato con capperi come antipasto, come ti fai selezione da un menu gourmet. Il governo messicano ha dichiarato il centro della città come un sito storico nel 1926, così come si cammina per le strade di ciottoli, si verifica un tempo di un tempo. Negozi che una volta erano grandi haciendas sono ora pieni di arte popolare messicana, oggetti d'antiquariato e belle ceramiche dipinte a mano. SMA è conosciuto come una mecca per artisti e amanti dell'arte. We had a wonderful stay. The house had everything we needed and more. i.e. we often ate dinner on the roof during sunset. It was obvious that the owner put much love, time, thought, and care into landscaping and decorating the house. The layout was great. There was 1, 2, sometimes 3 of us staying there and there was ample space to be alone or to be with others. We started out shopping at the big market but soon discovered we could get all the food we needed and support the vendors right there on Cinco de Mayo. You will come to find it´s a wonderful street. You'll get used to climbing the hill. I highly recommend this property. We thoroughly enjoyed our stay at this charming, colonial home. The home is comfortable, roomy, and airy. The outside garden/patio/living space off the living room is where we spent a lot of our time, painting, reading, eating, and entertaining. There are excellent doors, windows, and screens which allow the lovely breeze and light to flow through the house. The kitchen was well equipped and all the appliances worked well. The construction of the house with the pillars and boveda ceilings was amazing. The Mexican folk art added a lot of enjoyment to our month in the house. The beds and linens were very comfortable and the bathrooms were pleasant, again, with everything working well! The location of the house is terrific. There are schools with green space all around with the kindergarten directly across the street. The children are adorable and it was fun to hear them sing and laugh and play outside. The street is somewhat of a main street. It has a fair amount of traffic and you can usually walk out the front door and get a cab in a few minutes. There is a lot less activity in the neighborhood in the evenings. 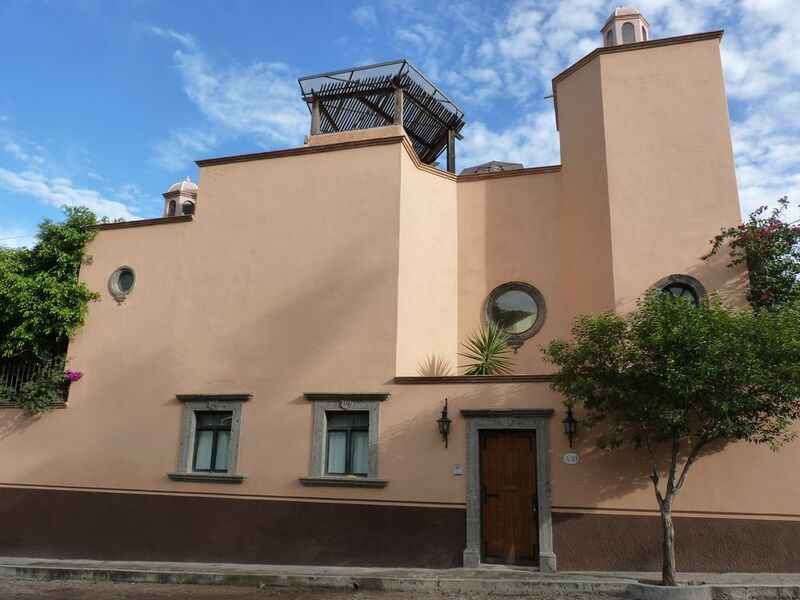 You are in walking distance of a number of fruit and vegetable stores, meat stores, a grocery store, a tortilleria, and a number of taco stands and good restaurants. It’s about a 5 block walk to the main street where you can always get a cab and also have many other choices for restaurants and services. Communication with the owner was excellent and timely. Ofelia kept our house clean. She obviously loves this home. We had fun communicating, even with the little bit of English and Spanish we knew. We hope to be able to stay here again in one of our future trips to San Miguel. We loved our stay at Don's beautiful home. It's our second stay and we discovered some new restaurants on Cinqo de Mayo Street! All around a delightful AND function house that met our every needs. My family just returned from a wonderful vacation in SMA, and Don's beautiful home was a huge factor in the success of the vacation. The photos don't really do it justice; the house is gorgeous, a work of art really, but also very, very comfortable. Don has obviously put a lot of effort into decorating, stocking and maintaining the property. The spacious house easily accommodates several adults, and the ground-floor terrace, balconies off the bedrooms, plus a spacious roof deck, provide numerous, lovely outdoor spaces with beautiful views. Located on a hill beyond the hustle and bustle of the central part of the city, it is quiet, and the air quality is very good. It's a pleasant walk into town. Don was a pleasure to deal with, as were the property manager and the maid. We can't wait to go back! Relaxed Living San Miguel Style! My husband and I have been coming to San Miguel de Allende for 6 years. This is our 3rd year in a row to Don's house and we couldn't be happier. It is by far the best home we have rented! It is roomy and beautifully appointed with Mexican folk art throughout the home. It is nestled in a quiet neighborhood with no buses passing by! There is a small nursery school across the street and the occasional sound of children's laughter is a delight to hear. We love spending time at home listening to the soothing sounds of the fountain in the courtyard, reading on the bedroom deck overlooking the courtyard, and watching the sunset on the upper terrace. The broad landscape view of the mountains and parts of town is stunning! The kitchen is well equipped for cooking and the dining area is comfortable. The beautiful fireplaces in the living room and master bedroom provide cozy warmth when the evenings get cool. The beds and linens are very comfortable. Ofelia the maid is friendly and efficient and Sue, the manager, is very helpful. I just spent a month in Don's house and I couldn't be more pleased. It's a beautiful home that feels comfortable, safe, and special - excellent layout. We cooked dinners many nights (found everything we needed) and benefited from the lovely china, big dining room table, and dishwasher! Plus cocktails on the patio or around the fireplace. All the bedrooms have balconies and excellent beds/mattresses. My guests were extremely pleased and slept well. The master bedroom has a lovely ceiling and fireplace; the closet is huge, the shower has excellent water pressure and having two sinks in the bathroom is great. I can't say enough good things about the 3rd floor terrace. I spent hours there painting, reading and taking in the view ... listening to the sounds of SMA. Thank you. The base rate is for four people. Additional persons will be charged at $30.00 per person/per night.